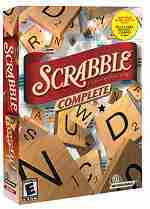 Click here to go to the UK Scrabble Games page. Timer included for fast-paced games. Large board with built-in storage space. Cloth tile bag & cherry wood color tiles. Recommended age: 4 to 10. Based on Official Scrabble Players Dictionary, Third Edition. Compact pocket size: 5.2" x 3.5" x 1.0". 1 player option: play against the computer. Choose from 9 skill levels. Play this great word game in Spanish. 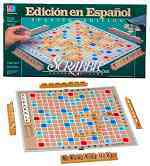 Ideal educational game for Spanish learners. Light and compact in handy zip-up case. Can be folded away mid-game and resumed later. Play against the clock in Scrabble blitz. Built-in Official Scrabble Players Dictionary. Play solo, or multiple players (up to 4). Play against friends over the Internet. 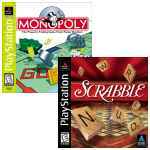 Over a dozen additional Scrabble minigames. 2 classic games on one card. Compatible with any Palm Powered PDA. Skill levels from beginner to expert. Large print edition for easier reading.